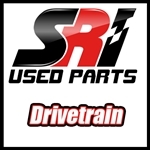 Over 40,000 square feet of used racing parts from only the top teams in NASCAR such as Roush Fenway, Richard Petty Motorsports and many more, SRI Performance is your direct source for high quality used racing parts. Items such as drive shafts, rear end gears, radiators, racing seats, springs, truck arms, brake rotors and many others move through our warehouse every day. Even if you are looking for carbon fiber air boxes, ball joints, upper and lower control arms we have a wide variety to choose from at excellent prices and quick delivery. We invite everyone to see our new shop to see the quality first hand. You will be surprised at how we inspect each individual part to make sure you get the highest quality part possible. If parts do not meet our standards, the item is scrapped and recycled properly. We are continuously loading incoming used racing parts so please be sure to check back on a regular basis. The items shown are just a small portion of what is available. If you don't see an item you are looking for or if you have any questions, please call our Sales Department at 1-877-604-8077 for assistance. Brake Rotors, Rotor Hats, Brake Pads, Carbon Fiber Brake Ducts and more. Complete and partial cars from Nationwide, Cup and other racing series. Racing Radiators, Oil Coolers, Electric Fans, Hardware and more. Bellhousings, Axles, 9" Rear End Housings, Rear Gears and Assemblies and more. 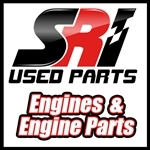 Used Racing engine parts including cylinder heads, intake manifolds, pistons, wrist pins and more. Sheet Metal from Top NASCAR Teams! Oil Tanks, Braided Lines, Oil pumps and more. Flat tappet Cup Engines, Roller cam Xfinity Engines. Used racing seats and head rests. Pit carts, Crash carts, Tool carts, Cool down units and more. Coil Springs, sway bars and more.